One meal that never, ever gets old? Chicken tenders. And fries. Am I right? One of my favorite parts of the Whole30 is that you can still eat delicious food. Just be mindful of your portions & the ingredients you are using, and you are good to go! 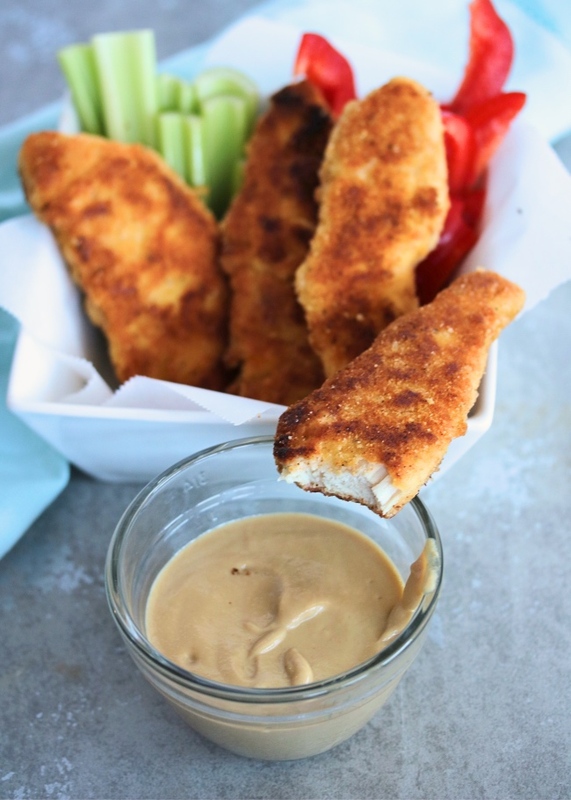 These crispy chicken tenders are the perfect example of a Whole30 compliant dish that feels like you're cheating. But there's no need to feel any guilt with this list of ingredients! Crispy chicken that tastes delicious is A-okay to enjoy! Serve 'em up with some homemade oven fries, a delicious dipping sauce, and a crisp green salad. When it comes to your dipping sauces- just watch out for non-compliant ingredients, especially sweeteners. 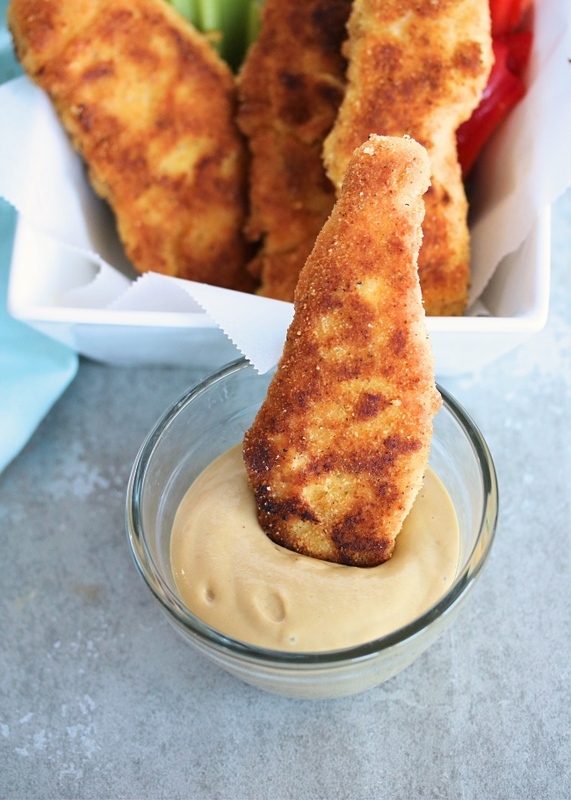 I love a honey mustard with my chicken tenders, but opted for this tahini version instead that is so tangy yet creamy & delicious! I saved the leftovers to drizzle on salad the next day too and it was perfect. Not a sesame fan? 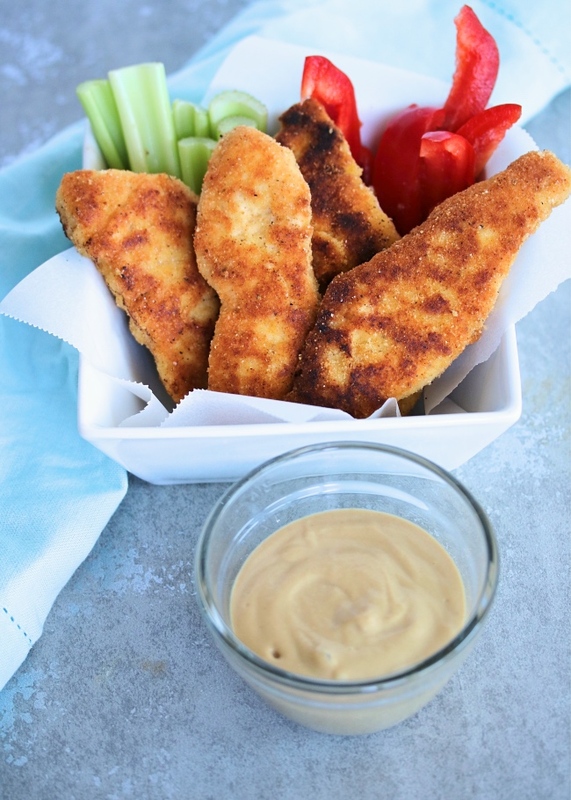 Go for a compliant ranch dressing or a sugar-free BBQ sauce! & Even if you're not a sauce fan, this crispy chicken stands on its own. I "double coat" for extra crispiness, and love how these turn out when they are quickly pan-fried on the stovetop. You need just a bit of avocado oil to get them to crispy perfection. If you're more of an oven person (which I found out MANY of you are after that poll on my Instagram stories!) these can totally be baked too. Just make sure they aren't overcrowded on the baking sheet- divide them onto two baking sheets if you have to. My other favorite tips for crispy chicken in the oven? Drizzle with a little oil before baking, and make sure you flip the tenders halfway through. Broil them at the end to get them perfectly golden brown. All of this is detailed below- just pick your track: in the oven, or on the stovetop! 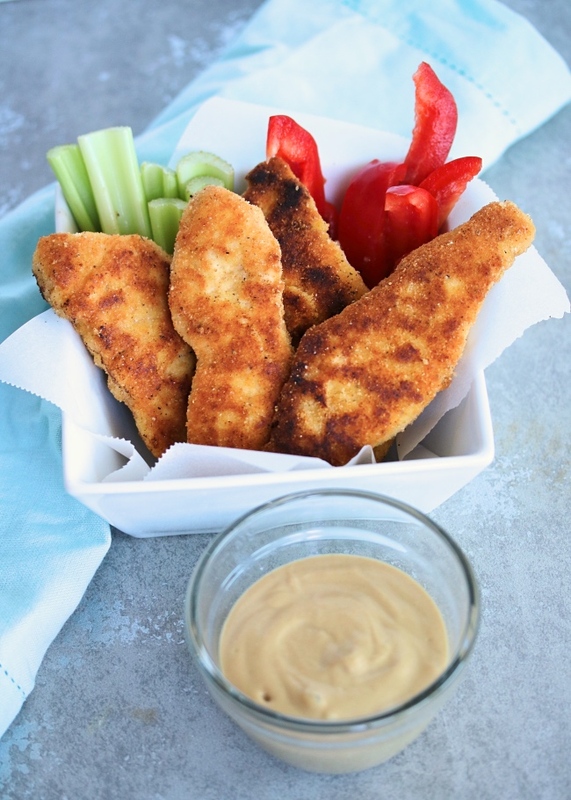 And don't forget to try this delicious tahini dipping sauce. It is SO dang easy, and so good I'm drooling just thinking about it! Preheat the oven to 400ºF. Line a baking sheet with parchment paper and set aside. In one medium shallow bowl, whisk the eggs. In a second bowl, combine the almond flour, coconut flour, and spices. Pat the chicken tenders dry, then dip them into the flour mixture. Shake off any excess, then dip into the egg mixture to coat. Dip into the flour mixture one more time, pressing in so the chicken is evenly coated. Shake off any excess, and transfer to the lined baking sheet. Repeat with all of the chicken tenders until they are all coated (you may need to do two baking sheets full to fit all of the tenders). 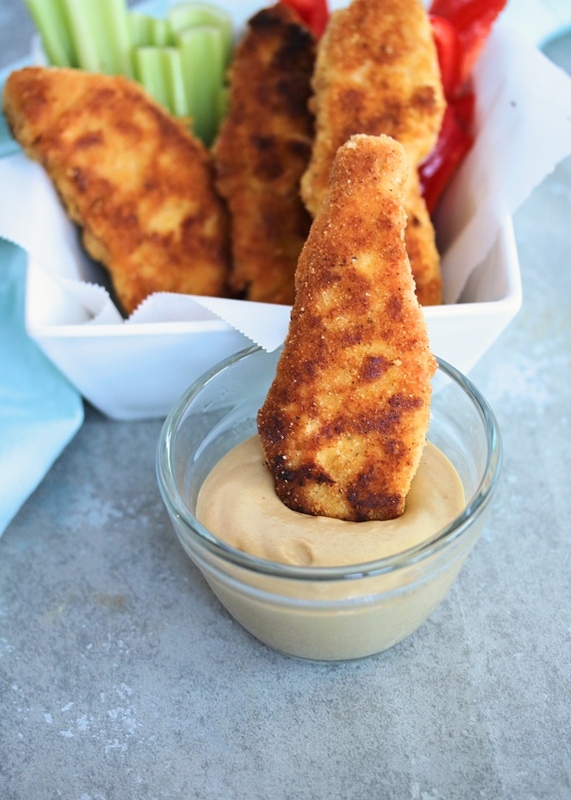 Lightly drizzle the coated chicken tenders with avocado oil. Bake for 10 minutes, then flip the tenders. Bake for an additional 10 minutes. Broil the tops for 3 to 5 minutes or until golden brown & crispy. Season with a little extra salt, and serve hot. Line a couple of plates with paper towels and set aside. Pat the chicken tenders dry, then dip them into the flour mixture. Shake off any excess, then dip into the egg mixture to coat. Dip into the flour mixture one more time, pressing in so the chicken is evenly coated. Shake off any excess, and transfer to the plates. Repeat with all of the chicken tenders until they are all coated. Heat the avocado oil in a large skillet over medium high (I prefer a ceramic non-stick skillet). Add the chicken tenders a few at a time so the pan isn't overcrowded. Pan-fry the tenders for 4 minutes per side, until the chicken is cooked through and golden brown. Season with a little extra salt, and serve hot. In a medium bowl, whisk the tahini, coconut aminos, and apple cider vinegar. Add water 1/2 Tbsp at a time until it reaches a consistency you like. I added about 1/4 cup of water total to mine. Continue whisking until smooth, then transfer to a small bowl for serving. Store any leftover dipping sauce in the refrigerator in an airtight container. This works great on salads or for dipping fresh vegetables like carrots, bell peppers, broccoli, and celery! If you don't have coconut flour, you can use almond flour only- just increase to 1 1/2 cups. These are the spices we like for our tenders, but you can easily switch them up to suit your tastebuds! Love it - but is there a way to make this without eggs? Thanks! I bet you could dip it in Nutpods or an almond or cashew milk...anything to get it moist. I'm just guessing, but that's what I would try. Jessie: can I sub all coconut flour for the almond flour to make this nut-free? My husband is allergic to nuts.